And probably February too, since as I sit here we’re adding to the record snowfall (more arctic ice coming our way, and more pictures too, as soon as I can get out there with my camera). So you can get a better idea of my dilemma, I’d like to explain that I am an outdoor girl. When the weather is nice I have the kids outside for as long as possible. We only come in to eat and sleep, and not even to potty – they can do that in the yard. I have a chair out there. TMI? But what do you do when the snow drifts are higher than the children? Up until now I’ve had an excellent way to burn the kids’ cooped-up winter energy, and that is called The Running Game. I’m not sure how it started, probably on a day similar to this one. I had the soundtrack to Charlie and the Chocolate Factory on and the kids just went nuts at “Wonka’s Welcome Song.” I think because one of them listened to it at home alot, and she got excited that we had it at Amy’s house too. I love it when those things happen and freak them out (like how you never thought your teacher had a life outside of the classroom and it was really creepy to see them at the grocery store buying, you know…food…to eat?). Anyway they started giggling and running around in circles so I opened the doors and gates and set them free. My house has a circle through the rooms on the first floor so they just did laps – it was awesome. It became a daily thing at the end of every circle time (and sometimes again late in the afternoon, when the energy is really starting to crank up). It was a lifesaver for me – the only way I’ve discovered to really tire them out when I can’t get them outside. A lot of my older kids graduated this year so I had to train the younger and newer ones to do The Running Game. At first they didn’t know what the heck was going on (What? You want us to run? Inside the house?) but then they got into it. Soon Tornado was old enough for it, and everything was fine until he reached the kitchen. Tornado doesn’t necessarily like to run, so much, as, maybe, eat the cat food. Or use her dish for water play. Or open the cabinets and dump out the clean dishes or help himself to some cereal. Or hunt for treasure in the compost bin under the sink. OR, my favorite, go in the bathroom and rub his hands all over the toilet seat. When the twins see him in there they think it’s time to go potty and they’re all in there slamming the door on each other or having water play. Miss M sees Tornado’s crib set up in the kitchen and climbs in, and they all think that is just hilarious and start piling in. And so it comes to pass that we have reached The Death of The Running Game. I tried dance parties but I’ve only got one dancer. They love throwing balloons around and chasing them, but only on days when there’s no baby to eat them. Our daily yoga has become run around Amy’s legs and then climb on her back in the middle of cobra and kill her. I usually bring a few outdoor climbers into the front porch and we can sometimes go out there if it’s warm enough. Last year I even resorted to bringing a small slide into the playroom, but this year after a friend donated a new kitchen playset to me, there’s no room (but that’s OK because we love the kitchen set thank you Trace and Chels!!). I used to let them put the couch cushions on the floor and jump around on them, but that leads to climbing on the cushion-less couches, which are now so destroyed that you can see the springs. Since I hate losing children in the couch, I frown on that activity. BUT that idea reminded me of the mats. 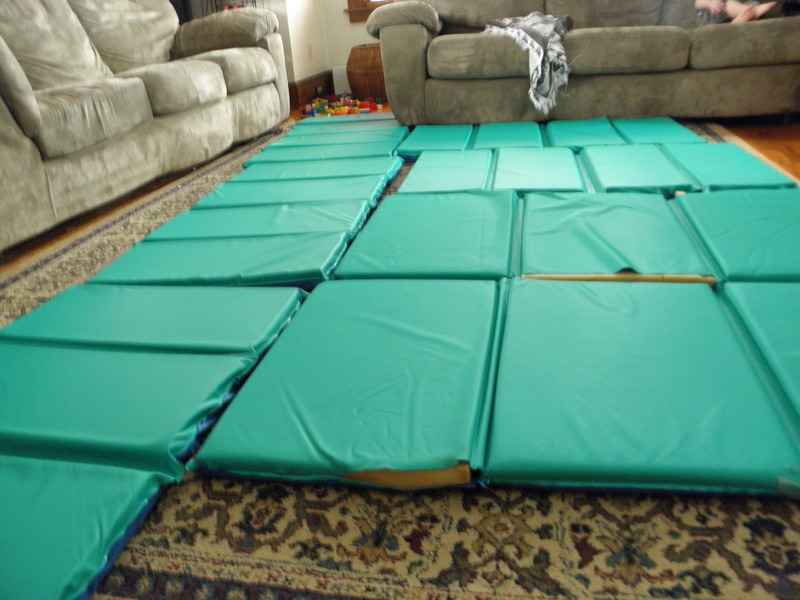 My group is young so they all sleep in pack and plays, and the preschoolers’ mats have been stored in the basement. Voila: a sea of mats. It’s not as good as the running game because I still can’t get them deep breathing. But it has given them a little room to ramble and spurred some other activities, such as fort building and climbing Mt. Mat. You learn to live with chaos, try to be very patient, and wait for warmer weather. This entry was posted in Child Care and tagged day care, snow days, stress by Amy Pybus. Bookmark the permalink. LOVE IT – keep up the good work Amy!